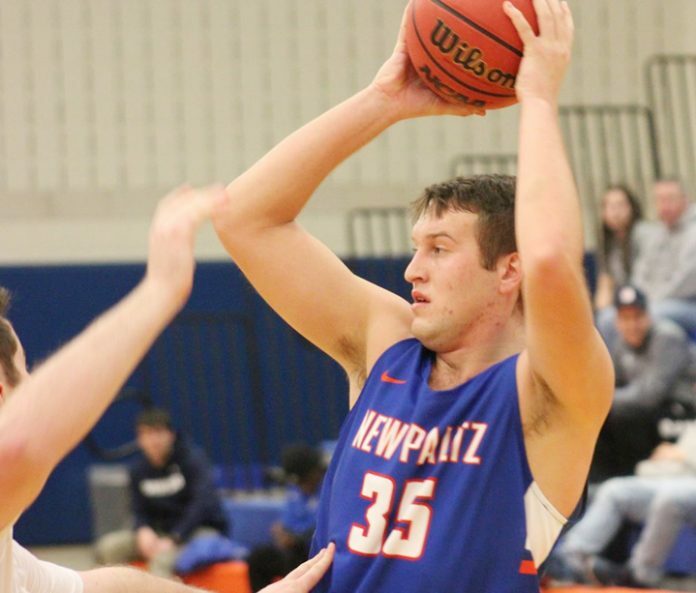 SUNY New Paltz men’s basketball team fell on the road against SUNY Geneseo Saturday, 62-58. GENESEO – The State University of New York at New Paltz men’s basketball team fell on the road against SUNY Geneseo Saturday, 62-58. The Hawks (11-9 overall, 6-7 SUNYAC) were up by as many nine before a 20-3 run early in the second half swung momentum back toward the hosting Knights (6-14, 3-10), which ultimately propelled the Geneseo victory. SUNY New Paltz took a slight 32-27 lead into halftime, but quickly saw a 12-point deficit following the Knights’ second-half run. However, the Hawks fought back with 10-straight points and got within two with four minutes left. Jake Passaretti missed his initial attempt in the corner for 3, but Paddy Parr fought for the offensive board for the Hawks. Passaretti got the ball back in hands and this time attacked the basket, spun and laid in his attempt to cut the score, 53-49. Passaretti then earned a trip to the foul line following a defensive stop by SUNY New Paltz and connected on both to get his team within two. Terrance Nichols put an end to the Hawks run after sinking a pair of free throws, but Scott Reisert answered with a basket underneath to get the game back within two. A made foul shot by the Knights was answered with another layup by Reisert to cut the score, 56-55 with less than a minute remaining. But, Geneseo continued attacking the basket and getting opportunities at the free throw line where it connected on 9-of-11 attempts in the final three minutes to remain in front. Following two made free throws by Zack Panebianco, Passaretti answered with a quick two points for the Hawks at the other end. SUNY New Paltz intentionally fouled to stop the clock and Panebianco made two more with seven seconds remaining to keep the two-point lead. After a timeout and up by three, the Knights intentionally fouled Parr to prevent the Hawks from tying up the game. Parr connected on the first attempt and tried knocking his second attempt off the rim for an offensive rebound, but his shot hit the back board without a touch from the hoop, which gave Geneseo back the ball. With two seconds left, SUNY New Paltz fouled one more time, putting Nichols on the line, who connected on both shots to ice the game for the Knights. Tristan Wissemann led the Hawks with 12 points and five rebounds, followed by Cory Garcia, who finished with 11 points, eight rebounds, three assists and two steals. Passaretti added 10 points and three assists, while Reisert finished with seven points, nine rebounds, three blocks, two steals and an assist.